After 19 months at the Cambridge Chronicle, I’m cutting loose, leaving my 9-5 to work as a freelance journalist and photographer. Why give up a steady paycheck for the headache of scrounging around and constantly looking for work? It’s flexible, and I want to travel. Since it’s inception, this blog has served primarily as a repository for photographs I take, whether they were taken professionally for newspapers, commercial clients, or just for fun. But, as I leave my post as assistant editor of the Chronicle, I see this blog becoming much more. It will continue to host photographs and photo essays, but I’ll also include articles I’ve written and possibly, some special documentary projects as well. 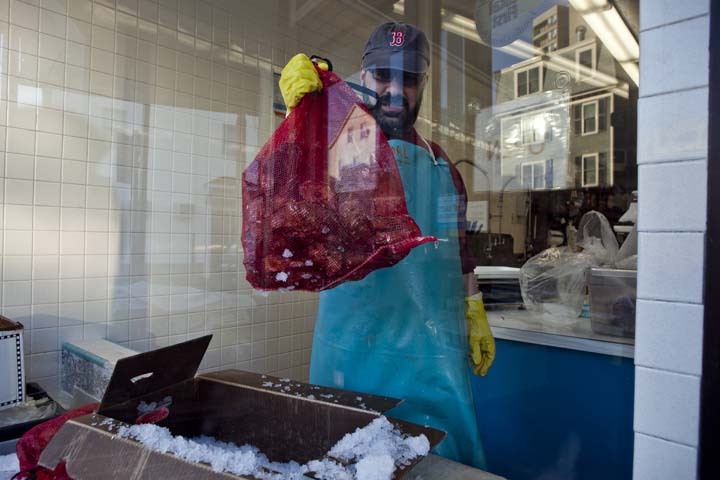 The New Deal Fish Market has been family owned and operated since 1928, and Carl Fantasia’s family, like many of the immigrants that populated East Cambridge in the early 20th Century, hails from Gaeta, Italy. Fantasia said he’s seen a lot of the immigrant families move out or pass away as the area gentrifies. Monday, Jan. 13, 2014. Photo by Erin Baldassari/Wicked Local Cambridge. Originally published Jan. 20, 2014 in the Cambridge Chronicle. When Carl Fantasia was growing up, he could remember his great aunt putting out a table and chairs right on the sidewalk for East Cambridge’s annual Cosmas and Damian Festival, a celebration honoring the patron saints of Gaeta, Italy. Like many in East Cambridge at the time, his family hailed from the same coastal city, swept up in a wave of immigrants from Italy and Portugal that relocated here in the 1920s. Friends of Fantasia’s great aunt would stop by her table to mingle and watch the parade of saints as it passed through. Now entering its 88th year, the festival has been recognized by the Smithsonian Institute as a piece of “living history.” Though not as grand as it once was, the celebration draws participants who truck in from out of town, Fantasia said, with some traversing the state for the annual festival. The old “townies” have moved out or passed away, he said. The face of East Cambridge is changing dramatically, a fact bolstered by recent statistics released last month by the city’s Community Development Department (CDD). While Cambridge as a whole grew by just over 10 percent from 1980 to 2010, the total population in East Cambridge increased by 70 percent, outpacing every other neighborhood in Cambridge, according to data compiled from the decennial census and the American Community Survey. SEE MORE CHARTS AND GRAPHS HERE. The dramatic growth is not surprising to anyone who’s watched Kendall Square transform from a decaying industrial district to the biotech hub it is today. Steel and glass high-rises have replaced the brick factories that once dominated the area, and as the industries in East Cambridge have changed, so have the workers. The North Point development will eventually add over 3 million square feet of housing and 2 million square feet of offices and lab space over a 45-acre development site that was once a rail yard. Monday, Jan. 13, 2014. Photo by Erin Baldassari/Wicked Local Cambridge. Today, apartments line the Charles River, and loft-style condos have moved into former factories. When the city was considering the North Point development, a sprawling 45-acre site over what was once a rail yard, Deputy City Manager Lisa Peterson said they carefully considered the impact of what they knew would be a huge influx of both people and businesses. Approved by the council in 2003, the development will eventually add 3 million square feet of residential space and 2 million square feet of offices and labs, all of which is new growth for the city. In response to surging population, Peterson said the city added street sweeping and rubbish services, along with first responders in the Fire and Police departments to keep pace with the new development. That’s also the reason the city is looking at increasing the opportunity for open space in East Cambridge, Rossi said. Despite gains made reducing the car count, parking remains an issue in East Cambridge, said East Cambridge Planning Team President Barbara Broussard. It’s something the city is studying, Rossi said. CDD statistician Cliff Cook said almost all of the new growth in Cambridge has been infill over industrial, underutilized or vacant land. 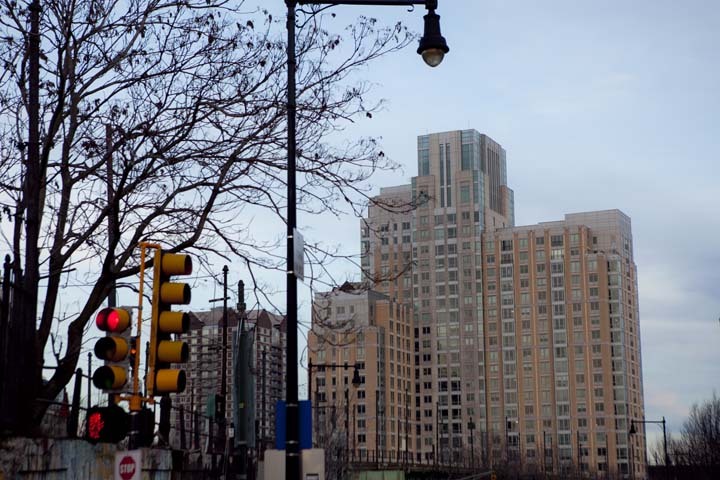 Although it wasn’t picked up in the 2010 census, the Alewife neighborhood is due for a similar transformation with more than 1,000 apartmentspermitted there over the past three years. “A lot of this construction is happening outside of the periphery of historically residential neighborhoods,” Cook said. A roughly 27 percent increase in the population of Riverside and a 41 percent increase in the population of Cambridgeport are mostly due to expansions from Harvard and MIT, Cook said. Roughly half of the city’s neighborhoods actually lost residents in the past three decades, according to CDD. Stella Saih, owner of the Greek Orthodox store, Byzantino, a spiritual arts store, said when she first visited East Cambridge roughly eight years ago, she was scared for her own safety. The appearance of the neighborhood has improved since then, she said. Photo by Erin Baldassari/Wicked Local Cambridge. For many East Cambridge business owners, the new growth is exciting. Stella Saih, owner of the Byzantino spiritual arts store on Cambridge Street, said she visited the area more than eight years ago and actually felt unsafe. When she opened her store in 2008, the streetscape had already improved some. Saih recently moved to Cambridge in August and said she’s happy to see businesses along Cambridge Street slowly becoming more upscale. 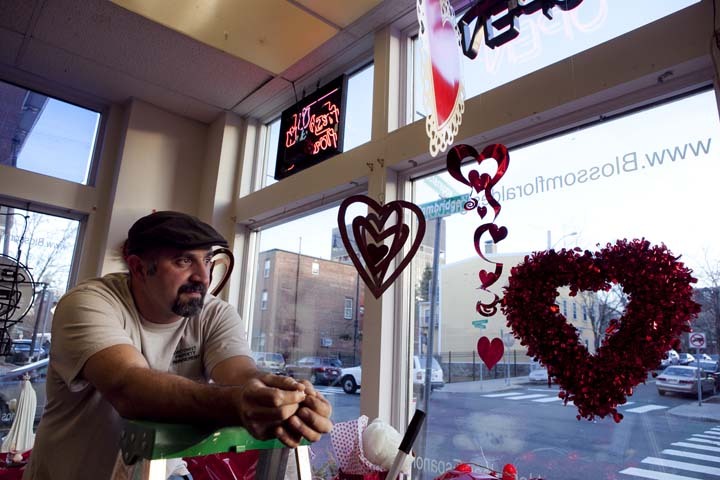 Tony Marques, an East Cambridge native and owner of Boston Floral Design on Cambridge Street, put it in less delicate terms. “A lot of the riff raff have moved out,” Marques said. That’s great for the bars and restaurants he said, though he hasn’t seen much of an increase in foot traffic coming into his store. Independent businesses still dominate the strip along Cambridge Street, all the way from the railroad tracks at the start of the neighborhood to the CambridgeSide Galleria Mall, which is comprised almost exclusively of chain stores. Cambridge resident and Boston Floral Design owner Tony Marques grew up in East Cambridge when it was a lot more “run down,” he said. Monday, Jan. 13, 2014. Photo by Erin Baldassari/Wicked Local Cambridge. The small sizes of the retail storefronts keep the big boxes away, said East Cambridge Business Association President Patrick Magee, enabling locally owned shops to maintain a foothold. As the area transforms, entrepreneurs are trying to keep pace, he said. Some make it; others don’t. Some of the success stories – doggie daycare center, Boston Dog Company; the Hub Bicycle Co.; Café Kafofo – seem to be catering to a young professional crowd with money in their pockets, Magee said. Although there may not be as many families as there were three decades ago, the neighborhood saw a 42 percent increase in the number of family households, compared to zero growth for the city as a whole. Conversely, non-family households in East Cambridge doubled two times over, increasing by over 200 percent in the same time period. That’s mostly the result of the type of housing – studio, one- and two-bedroom apartments – that has been built in Cambridge over the past three decades, Cook said. State Rep. and city Councilor Tim Toomey said the council is poised to begin evaluating new ways to encourage or require developers to build larger-sized units to accommodate families. Cafe Kafofo opened up two years ago on Cambridge Street, catering to a young professional crowd. 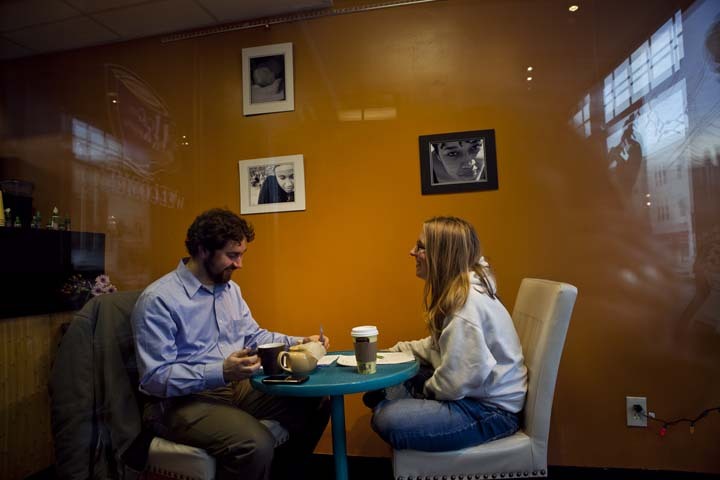 Inside, Cambridge resident Tim Severyn and East Bsoton resident Elizabeth Rucker grab a coffee while taking a break from their jobs at the East End House, another Cambridge Street establishment. Photo by Erin Baldassari/Wicked Local Cambridge. Just what all these new residents want from their local retailers was recently the subject of a “Customer Intercept Survey” released by CDD on Jan. 7 this year. The study found that roughly two-thirds of East Cambridge shoppers are from Cambridge, including many from the surrounding neighborhoods. Over half work in the area and nearly half of them are pedestrians who walked there. Respondents said they’re really looking for clothing stores, specialty shops and sit-down restaurants in the area. Fantasia, whose family has owned the New Deal Fish Market on Cambridge Street since 1928, was a founding member and the first president of the East Cambridge Business Association. People laughed at him when he told them he was leaving his career in the energy field to take up the family fish business. He took a gamble, he said, and it paid off. The store was once populated by immigrant families with many mouths to feed. Now, Fantasia said young people looking for fresh ingredients are paying his bills. On a recent Monday afternoon, Somerville resident James Alex Palmer stopped in to buy a few whole fishes. It’s a great time for East Cambridge businesses, said Fantasia, who was a founding member and the first president of the East Cambridge Business Association. Itself a new organization, the East Cambridge Business Association has been instrumental in organizing the local retailers, Fantasia said. Before the association came in, “there was absolutely no sense of community among the businesses.” Flower planters, street light improvement and the neighborhood’s annual Rib Fest, which began in 2010 out of the association, are changing all of that. As more locally-conscious consumers infiltrate the area, they’ll demand more coffee shops, food stores, and specialty retailers, he said.